I met Marlieke Kieboom at the SIX Nordic event about Social Experiments in Desember 2014. She and Chris Sigaloff from Kennisland (Knowledgeland) in the Netherlands facilitated a workshop around the question: How to set up social experiments? They talked about their experience setting up a social lab with elderly people in Amsteldorp. How they experimented, tried, failed, improved and learned. This was really inspiring and educational to me, so I asked Marlieke to do a podcast with me about this topic, so even more people can learn from their experience. And here it is. SIX Nordic Podcast Episode 4: A talk with Marlieke Kieboom from Kennisland about social labs in the Netherlands. Hope you’ll enjoy it. Just recently Kennisland published a publication in english about how you can run a social lab based on their experience from Amsteldorp. 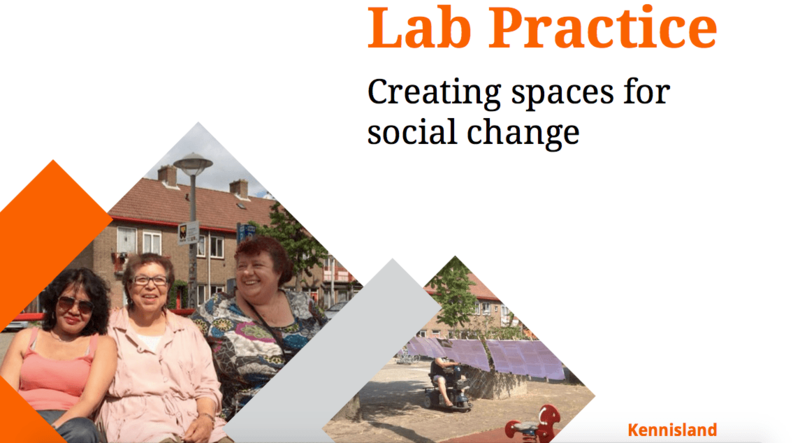 You can read all about it, and download the publication here Lab Practice: creating spaces for social change. I would also recommend anyone interested in social labs to check out the conference by Nesta called LabWorks 2015 – Global Lab Gathering. It’s next week, the 9th-10th of July in London! I really whish I could be there! LabWorks aims to bring together public innovators from across the world to hear about the latest tools, learn new skills, share thinking and experience and build the basis for future collaboration. You can also subscribe to the SIX Nordic podcast on iTunes. You can read more about the SIX Nordic Network here. Jeg ønsker å bruke kunnskapen jeg har til å utrette noe samfunnsnytting.